For easy loading of wood, Landmann 591320 Smoky Mountain Bravo Premium Charcoal Grill has a side door and also a large detachable ashtray that allows you to conveniently remove the ashes. The cabinets and side tables that go along with the grill will give you the ease of storage and comfort of preparation. The temperature gauge and the flexible side vents give you the option to maximize control of the temperature. The design of this model simply gives you the ease in putting its parts together. Its remarkable attributes allows you to maneuver the grill efficiently and effectively. Just like the adjustable coal trays, removable ash tray, spacious cabinets, side tables, and temperature gauge. 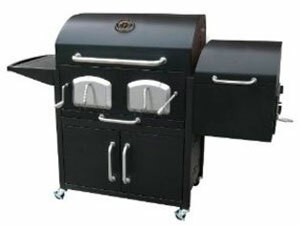 Its caster wheels enable you to move the whole grill comfortably and safely. The whole grill is also crafted from durable materials. The grilling grates are of good quality and work well in very high temperatures. You will also find that the handles do not rust since it is made of stainless steel and chrome. Assembly is one of the issues raised with this model of Landmann Grill. Based from the instructions it only takes around 90 minutes to assemble the whole grill however in many instances it took almost 6 hours before the whole thing was put together. Another issue is the temperature. At some point it can reach a high temperature but not sufficient enough to grill or cook some food.